That's irreverent, all right! I guess it's kind of funny. Riffing on the sense that Batman and Joker need each other. Who is PSH supposed to play? I"m surprised they didn't change the tagline. "Love is a force of chaos" or something. That altered poster actually really bothers me. I don't find it cute or funny. I don't like the idea of TDK imagery or hype getting mixed up with the legacy of BBM. And, spoofs on the Brokeback poster have always made me feel really defensive of Brokeback. It bothers me too, but a little less so in the context of a "new" Heath fandom. But I do hope the interest inspires at least a few of the new fans to check out his other movies including Brokeback. When I first saw BBM I hadn't heard of a single person in the movie other than Randy Quaid -- had seen The Day After Tomorrow but didn't connect the young male lead with Jake. After seeing it I rented some of Heath's movies and saw Jake's newer ones, which I probably would never have done. Don't know, however, how many younger people would react that way. Before BBM I had only a vague notion of who Jake and Heath were too. I'd seen Day After Tomorrow and I'd seen Monster's Ball (but I actually had and still have no memory of Heath's role particularly in Monster's Ball). I associated Heath with all the advertising I'd seen for A Knight's Tale, but it's a movie I've never seen. So, I had no expectation with regards to either of them really. And obviously, I was more than pleasantly surprised. I still haven't felt compelled to rent or see their other movies. In fact, I have sort of an aversion to the idea of seeing them in other roles. I went to see TDK because it's such a special circumstance. And, as I've said a lot... I really loved TDK. But, at the same time I really, really dislike seeing it mixed up with BBM's legacy. I wish there was a way to keep the two very separate and distinct entities. To me personally, Brokie-ness has never been about being a Jake fan or a Heath fan (or other BBM actor fan) particularly. Although, I find it fun keeping up with the JJJ and HHH threads, etc. for the sake of keeping up with current Brokie conversations and news, etc. I wanted to put in my two cents about TDK, which I saw over a weeka ago. I enjoyed the opportunity to see Heath play another role, as I have become quite fond of his career and acting abilities but it was so sad to know, "this is it, this is goodbye". Whenever I see an actor disapear into a character, and there are few who could do it like Heath, I will probably be doing a comparison in my mind. 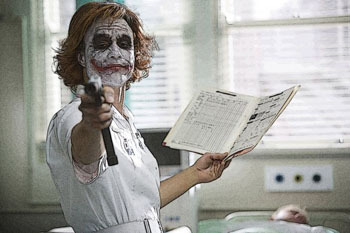 One thing I did want to comment on, and I mentioned this to Paul already, is the scene where the Joker is posing as a nurse. Did anyone see (I've not read the whole thread) the name tag? That nurse put me in mind of a vision of Reba McEntyre on LSD. When I first saw BBM I hadn't heard of a single person in the movie other than Randy Quaid -- had seen The Day After Tomorrow but didn't connect the young male lead with Jake. I know just what you mean, I had see Day After Tomorrow and if you had asked me who played Jake's part I would have confidently said: "Toby McGuire". Same for October Sky. That's irreverent, all right! I guess it's kind of funny. I have always throught Brokeback parodies that had a certain quality and point and relevance to them were great stuff - kind of confirming BBM as an important cultural reference point. And this one struck me as one such. I think the whole fandom's been moving so fast the photoshopping is happening fast and furious - that's why they've not altered more than the barest necessities, as it were. What PSH has to do in there beats me. But if you think that one was irreverent.... please don't go check out TDK fandom! Oh my - I'd say that one was totally mild. One of the mildest. Though, the irreverence centers round other stuff than Brokeback. From my limited browsing I've only seen one single other BBM reference and that was someone posting a vid of J&E's kiss in the SNIT. I found it both cute and funny, quite endearing really. I've seen TDK 3 times now, and I'd heard what was on the tag after the second viewing. So this third time I looked for it. But it’s completely illegible/invisible to the camera. So it was more of an inside thing . . .